hudsonlyricopera.org - 2012 HLO Goes to Broadway! Auditions for “The Masked Ball” by Giuseppe Verdi. The Hudson Lyric Opera is looking for a Soprano (Amelia), and smaller parts: Baritones (Tom, Samuel and Silvano) and a Tenor (The Chief Magistrate). Also all voice parts needed for the chorus. Performance dates: Saturdays November 3, 10 and 17 at 7:30PM and Sundays, November 4, 11 and 18 at 3PM at Trinity United Methodist Church, 47 East Main Street in Stony Point NY. Hudson Lyric Opera Goes To Broadway! There are two performances: Sunday Sept. 23, 2012 at 3pm at Trinity United Methodist Church, 47 East Main St., Stony Point, NY; and Thursday, Sept. 27, 2012 at 7:30pm at Graymoor Spiritual Life Center, Pilgrim Hall, 40 Franciscan Way, Rte. 9, Garrison, NY (call 845-424-2111 for more information). 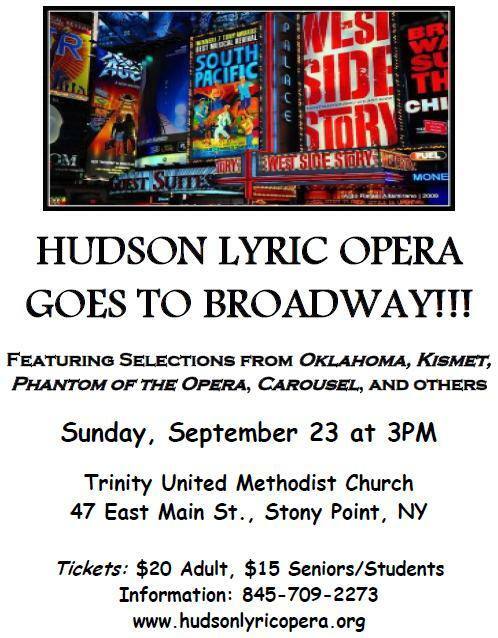 Stony Point - The Hudson Lyric Opera (HLO) goes to Broadway! Sunday, September 23, 2012 at 3PM at the Trinity United Methodist Church, 47 East Main Street, Stony Point NY. The afternoon will feature songs from Broadway shows Phantom of the Opera, Kismet, My Fair Lady, Carousel, and Oklahoma, among others. The Hudson Lyric Opera, now in its seventh season, is comprised of many talented artists who live or work in the lower Hudson Valley. Artistic Director, Rosalinda Perez’s purpose in founding this opera company was to provide local musicians and artists the opportunity to showcase their talents while providing the local community with a more convenient access to this art form. Tickets are $25 for Adults, $20 for Students/Seniors. For Information call (845)709-2273 or email us at info@hudsonlyricopera.org or visit our website: www.hudsonlyricopera.org.